Cultivating and enhancing flavors while accentuating textures are the main incentives for adding wine to recipes. When deciding what kind of wine to cook with, many cooks will agree that your best bet is to cook with a wine that you would drink. Remember, it is only the alcohol that diminishes during the cooking process, not the poor quality or undesirable flavor. Wines designated as "cooking wines" tend to be cheap, salty and often incorporate additional spices, herbs, and even preservatives. Bottom line -- they will do little to enhance your recipe. The good news is you don't need to spend big bucks on a wine that you intend to cook with, save that for the wine you plan on serving and drinking with the meal itself. If you shoot for ultra cheap (as in under $5), you will likely be disappointed in both the flavor and the overall contribution to your recipe. You may as well consider forgoing the wine addition altogether. Think of flavoring a recipe with wine in the same light as you would adding a spice. 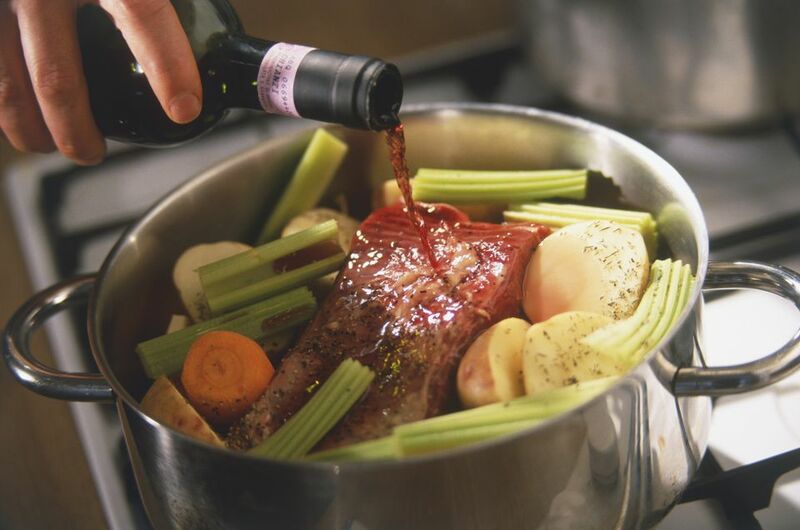 The flavors tend to mellow the longer you cook the wine in the dish and it is recommended that a young, strong red wine is allowed to cook for at least 45 minutes. A popular culinary question is whether you should use a red or a white wine. The answer all depends on what you are cooking. Reds tend to bring color, clarity and a distinctly dry characteristic to the foods they flavor. White wines are known to bring an acidic quality with a bit of pucker power. Use reds for flavoring red sauces with red meat. ﻿For example, a bold red wine would be perfect for a meatball marinara or stout stews with lots of heavy vegetables. On the flip side, white wines are the perfect addition to cream sauces or emphasizing white meats or seafood. Contrary to popular belief, not all of the alcohol will evaporate from the cooking process and this should be kept in mind when considering your recipe. The concentration of residual alcohol that remains in your dish depends on the length of time and way in which it was cooked. For example, boiling a sauce for 25 minutes will remove considerably more alcohol than merely baking a dish for 15 minutes. Above all, cooking with wine should be fun. If you are just starting out, keep it simple -- try a young bold red (zinfandel, merlot, cabernet sauvignon) in Aunt Betty's family spaghetti sauce recipe or a glug of chardonnay in your creamy alfredo chicken recipe. Experiment with using wines in recipes -- it's not rocket science and shaking recipes up with a splash or two of wine will likely make your favorite recipe that much better.